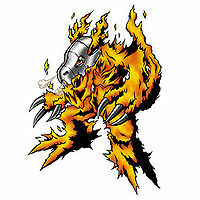 A Flame Dragon Digimon whose entire body is wrapped in flames. 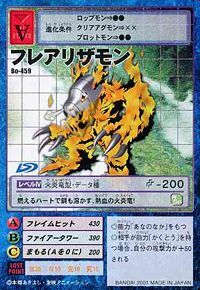 It is a hot-blooded Digimon that possesses both a heart that burns like fire and the power of a dragon. Although the flames throughout its body are generated by its high-temperature skin combusting, its skin has remarkable regenerative abilities, and so Flare Lizamon is able to continue burning until it is extinguished. 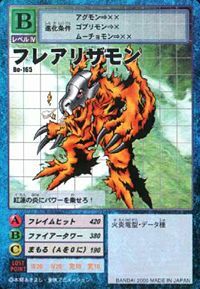 In addition, the claws on both its arms are scorched in the flames across its body and have become extremely hot, so the opponent that it has torn apart suffers double damage from being both lacerated and burned. Its Signature Move is blasting the flames of its entire body at the enemy in the form of an enormous pillar (Flame Tower). Its Special Move is continuously firing high-temperature flaming shots (Flame Hit). 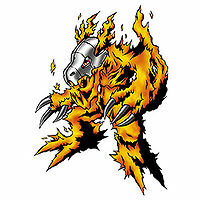 A Flame Dragon Digimon whose body is wrapped in flames. Possessing a heart that burns like fire, it protects itself with the helmet on its head and wages powerful attacks with its sharp claws and fangs. A portmanteau of "Flare" and "Lizard". Anime/Manga Digimon Adventure 02: "The Great Free-for-all Fight in New York and Hong Kong!" Flame Hit  フレイムヒット Fureimu Hitto Blaze Buster Shoots out continuous high temperature flame bullets. Fire Tower  ファイアータワー Faiā Tawā Tower of Fire Releases an enormous pillar of its body's flames at its enemy. Thrust Rush  スラストラッシュ Surasuto Rasshu Thrusting Rush Rolls into a ball and somersaults into the enemy. A troop of Flare Lizamon make up Dorbickmon's army. Its silhouette appears when the Old Clock Shop Man tells how Quartzmon created the DigiQuartz. Flare Lizarmon is an unobtainable enemy Digimon. 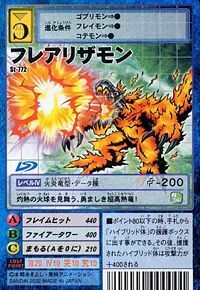 Flare Lizamon is an obtainable Digimon. Evolves from Elecmon (3-5 DP) and can evolve to Triceramon (0-5 DP) or Vermillimon (6+ DP). Can be evolved from Toy Agumon if above level 17. He also gives you a request mission to obtain a Magma Stone at Lava River. Can be evolved from Candmon if above level 20 and Dragon EXP 650. Flare Lizamon is available as a Digimon Medal. Can be evolved from Candmon or Kudamon. Can be evolved to Cyberdramon, Delumon, Pumpmon, or Tyilinmon. This brave, super-hot dragon attacks with scorching fireballs! It carries its power in its crimson flames! This hot-blooded dragon of fire possesses a burning heart that melts even steel! ↑ Digimon Xros Wars: "To a New World! The Fire-fury General's Dragon Land"
↑ Digimon Xros Wars: "Stand up, Kiriha! The Xros Heart Rescue Strategy"
This page was last modified on 20 February 2019, at 03:16.